​Your teams. Your favorite writers. Wherever you want them. Personalize SI with our new App. Install on iOS or Android. It’s true that Kevin Durant can do whatever he wants with his career and his life. But this is also true: We don’t have to care, or even watch. As long as we do, we’re entitled to opinions about what he does, and I think his move to the Golden State Warriors stinks. It is a competitive cop-out, worse than saying, “If you can’t beat ’em, join ’em,” because Durant could have beaten the Warriors, and he joined ’em anyway. Forget this silliness about Durant’s “evolution as a man,” which Durant cited on The Players’ Tribune as a reason for the move. If Durant really wanted to evolve as a man, he would go to Sacramento, where he would age 10 years by Christmas. This is about having championship rings, plural, delivered via express shipping. From a competitive standpoint, this makes LeBron James’s formation of a superteam in Miami seem like an enormous risk. Durant just pulled the ultimate bandwagon move. He left the NBA’s second-best roster in Oklahoma City to join the best one in Oakland. Again: He can do this. It’s a free world and a free market. But where is Durant’s competitive spirit? Barely a month ago, Durant walked out of Game 7 of the Western Conference Finals after his Thunder lost the last three games of an epic series. Competitive zeal should have made him want another shot at those guys. Isn’t that why we watch, why we play, why we care? I can buy a ring, just as I can ask a tailor to make an ugly green sport coat, but that wouldn’t make me a Masters champion. If Durant wins a title with Golden State, as he probably will, it will be an impressive achievement. But there will be this lingering sense that he took the easiest possible way to do it. When James left Cleveland for Miami, a lot of people (myself included) railed against him for trying to arrange an easy path to a championship. There was certainly some truth to that, but in retrospect, the view was a bit too narrow. James knew he had carried a dysfunctional organization in Cleveland (the Cavs were awful as soon as he left) and he enjoyed a chance to put a team together that summer. This is different. 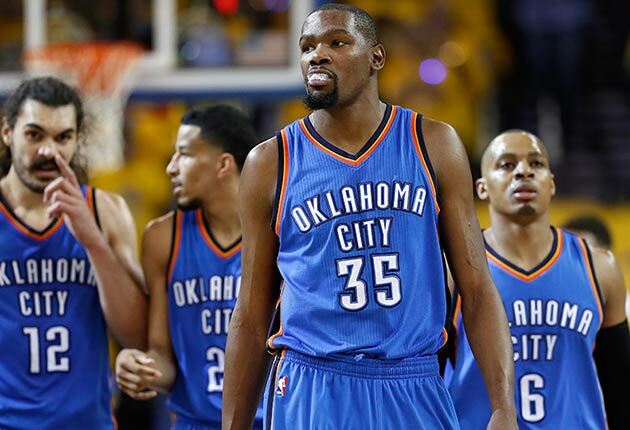 Durant has Russell Westbrook and a team that is stocked with length, skill and athleticism. Oklahoma City didn’t win a championship, but the Thunder were clearly good enough to do it. Everybody who cares about basketball was looking forward to Warriors–Thunder II. It’s really a shame. And yes, I understand the appeal of rings. Durant clearly has his best shot with Golden State. I actually don’t think this will be quite as easy as people assume today; these things rarely are. But the point is that Durant thinks it will be easier. He doesn’t seem to realize: beating the Warriors would have meant so much more than winning with them. One championship with the Thunder would have been a bigger achievement for Durant than two with the Warriors, because he would have carried that team from the bottom to the top. Durant will never be as loved in Northern California as he was in Oklahoma City, because Steph Curry and Klay Thompson and Draymond Green were there first. It’s not about being loved; it’s about why players are loved. These games are only a big deal because we make them a big deal. Oklahoma City was invested in Durant in a way that Golden State never will be. Someday, Durant will understand what he just gave up. It took James a while to understand it after he left Cleveland, but eventually he did. But then, the whole concept of achievement in sports gets twisted sometimes. We talk about winning being everything, and championships or bust, and we oversimplify at best and distort at worst. If you look hard enough, you will not just find rings on backup shooting guards and utility infielders; you will find them on vice presidents of marketing and traveling secretaries. Are they all “winners” simply because their teams won? Heck, until Cleveland beat Golden State last month, many people focused more on James’s Finals record (2–4) than the fact that he is so obviously the best player of his generation, and that some of those Finals teams might have missed the playoffs without him. Kevin Durant is a great player, the deserving 2013 NBA MVP, and a lock of a future Hall of Famer. Likeable guy, too. He may win more games than he would have won in Oklahoma City, and he may win more rings. But when you see Durant launching those gorgeous jumpers from all over the court next year, don’t be fooled by the arc of the ball. He is shooting lower now. His choice.